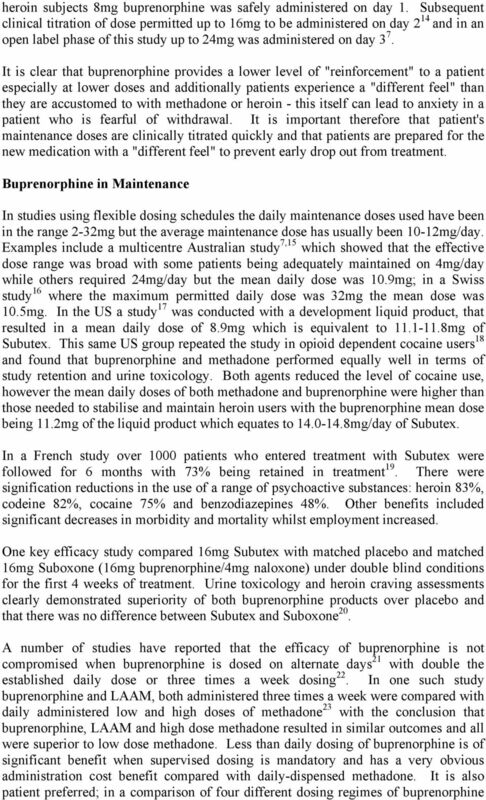 Download "BUPRENORPHINE THERAPIES FOR THE TREATMENT OF OPIOID DEPENDENCE - SUBUTEX AND SUBOXONE*"
5 86% of subjects preferred either alternate day or every third day dosing to daily dosing 13. Buprenorphine in Detoxifications A Cochrane review 24 of many studies investigating buprenorphine's use in detoxifications concluded that buprenorphine appeared to be more effective than clonidine in reducing signs and symptoms of opiate withdrawal and in supporting the completion of withdrawal from heroin. This effectiveness and superiority over conventional detoxifications from heroin has been demonstrated in short-term detoxifications (5-10 days) 25,26. An inpatient placebo controlled study 25 used a 5-day withdrawal schedule which resulted in 90% (n=63) of patients experiencing no or mild withdrawal symptoms and 61% experienced no side effects. In an open label outpatient study buprenorphine was compared to a group receiving symptomatic medication (clonidine, analgesics, benzodiazepines) - 86% of the buprenorphine group completed their withdrawal programme compared to 57% of the symptomatic group. 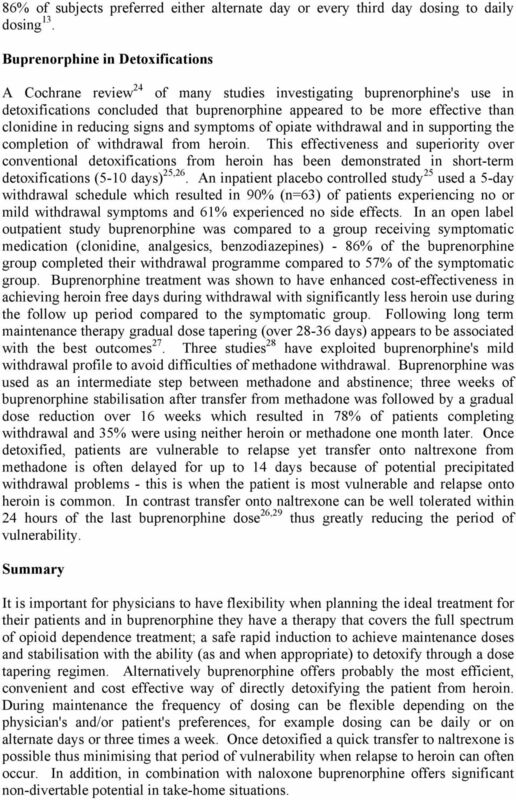 Buprenorphine treatment was shown to have enhanced cost-effectiveness in achieving heroin free days during withdrawal with significantly less heroin use during the follow up period compared to the symptomatic group. Following long term maintenance therapy gradual dose tapering (over days) appears to be associated with the best outcomes 27. 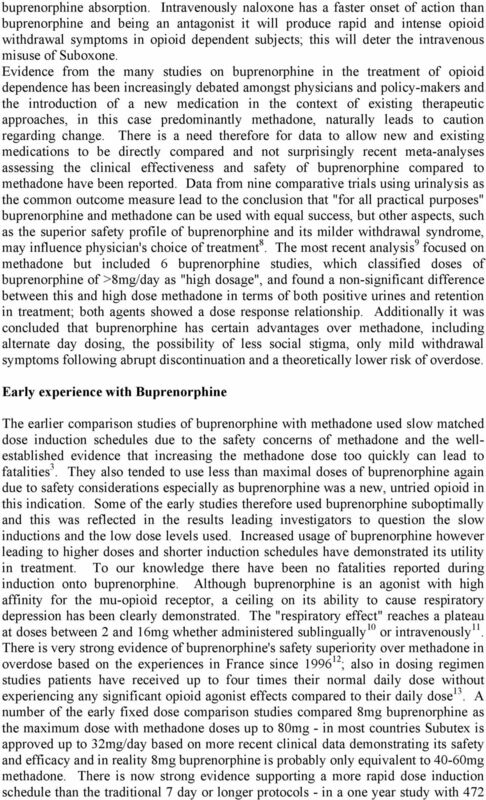 Three studies 28 have exploited buprenorphine's mild withdrawal profile to avoid difficulties of methadone withdrawal. 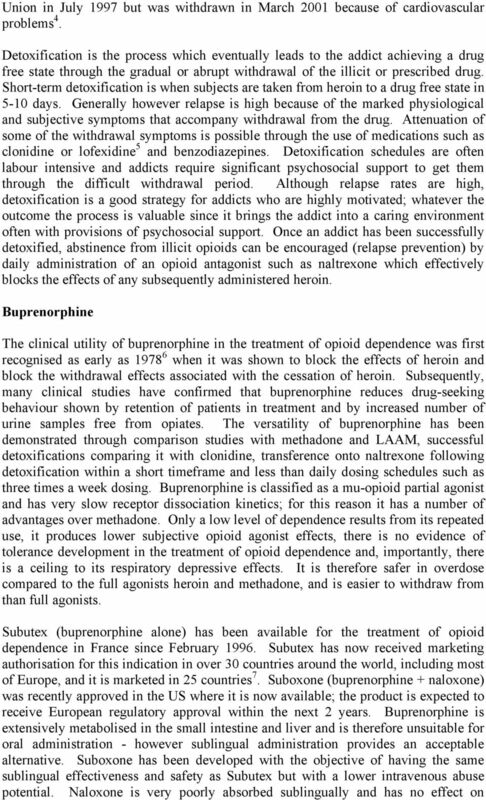 Buprenorphine was used as an intermediate step between methadone and abstinence; three weeks of buprenorphine stabilisation after transfer from methadone was followed by a gradual dose reduction over 16 weeks which resulted in 78% of patients completing withdrawal and 35% were using neither heroin or methadone one month later. Once detoxified, patients are vulnerable to relapse yet transfer onto naltrexone from methadone is often delayed for up to 14 days because of potential precipitated withdrawal problems - this is when the patient is most vulnerable and relapse onto heroin is common. In contrast transfer onto naltrexone can be well tolerated within 24 hours of the last buprenorphine dose 26,29 thus greatly reducing the period of vulnerability. Summary It is important for physicians to have flexibility when planning the ideal treatment for their patients and in buprenorphine they have a therapy that covers the full spectrum of opioid dependence treatment; a safe rapid induction to achieve maintenance doses and stabilisation with the ability (as and when appropriate) to detoxify through a dose tapering regimen. Alternatively buprenorphine offers probably the most efficient, convenient and cost effective way of directly detoxifying the patient from heroin. During maintenance the frequency of dosing can be flexible depending on the physician's and/or patient's preferences, for example dosing can be daily or on alternate days or three times a week. Once detoxified a quick transfer to naltrexone is possible thus minimising that period of vulnerability when relapse to heroin can often occur. In addition, in combination with naloxone buprenorphine offers significant non-divertable potential in take-home situations. 6 REFERENCES 1 VP Dole, M Nyswander : JAMA 193, pp80-84, VP Dole, M Nyswander : N.Y. State J. Med 66, pp D Harding-Pick : Lancet 341, p , JM Binchy, EM Molyneux, J Manning : Brit. Med. J 308, pp , S B Karch, BG Boyd : West. 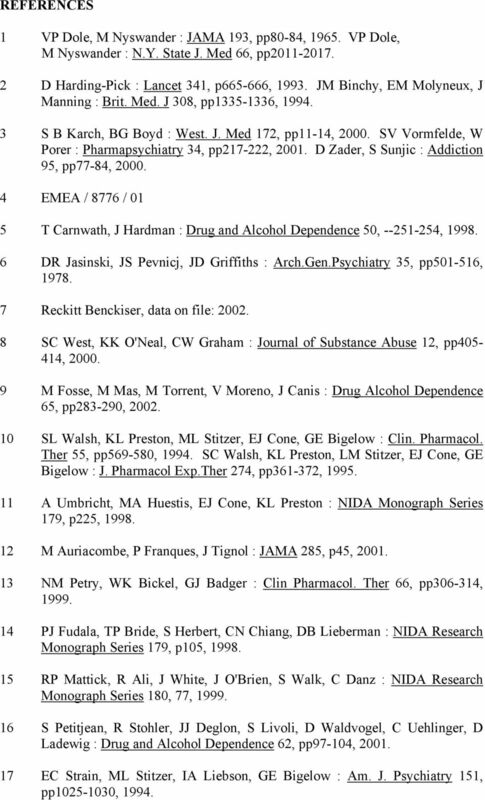 J. Med 172, pp11-14, SV Vormfelde, W Porer : Pharmapsychiatry 34, pp , D Zader, S Sunjic : Addiction 95, pp77-84, EMEA / 8776 / 01 5 T Carnwath, J Hardman : Drug and Alcohol Dependence 50, , DR Jasinski, JS Pevnicj, JD Griffiths : Arch.Gen.Psychiatry 35, pp , Reckitt Benckiser, data on file: SC West, KK O'Neal, CW Graham : Journal of Substance Abuse 12, pp , M Fosse, M Mas, M Torrent, V Moreno, J Canis : Drug Alcohol Dependence 65, pp , SL Walsh, KL Preston, ML Stitzer, EJ Cone, GE Bigelow : Clin. Pharmacol. 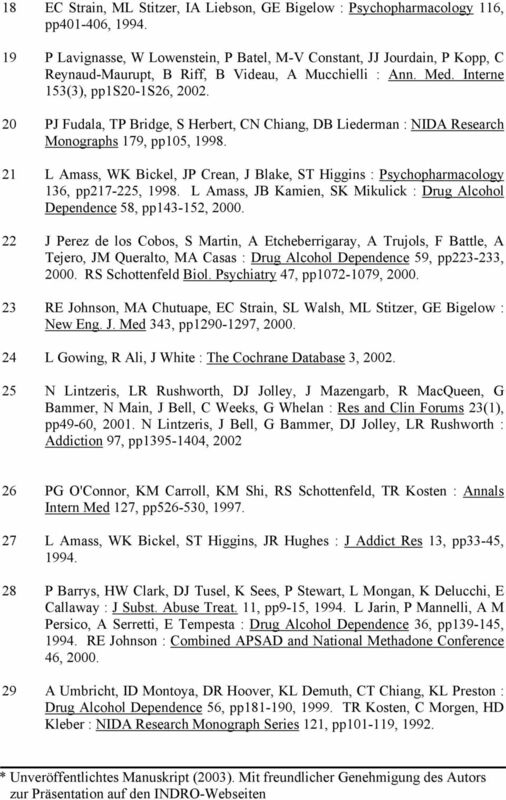 Ther 55, pp , SC Walsh, KL Preston, LM Stitzer, EJ Cone, GE Bigelow : J. Pharmacol Exp.Ther 274, pp , A Umbricht, MA Huestis, EJ Cone, KL Preston : NIDA Monograph Series 179, p225, M Auriacombe, P Franques, J Tignol : JAMA 285, p45, NM Petry, WK Bickel, GJ Badger : Clin Pharmacol. Ther 66, pp , PJ Fudala, TP Bride, S Herbert, CN Chiang, DB Lieberman : NIDA Research Monograph Series 179, p105, RP Mattick, R Ali, J White, J O'Brien, S Walk, C Danz : NIDA Research Monograph Series 180, 77, S Petitjean, R Stohler, JJ Deglon, S Livoli, D Waldvogel, C Uehlinger, D Ladewig : Drug and Alcohol Dependence 62, pp97-104, EC Strain, ML Stitzer, IA Liebson, GE Bigelow : Am. J. Psychiatry 151, pp , 1994. Heroin. How Is Heroin Abused? How Does Heroin Affect the Brain? What Other Adverse Effects Does Heroin Have on Health? Heroin. How is Heroin Abused? What Other Adverse Effects Does Heroin Have on Health? How Does Heroin Affect the Brain? 01736 850006 www.bosencefarm.co.uk DRUG AND ALCOHOL DETOXIFICATION: A GUIDE TO OUR SERVICES An environment for change Boswyns provides medically-led drug and alcohol assessment, detoxification and stabilisation. 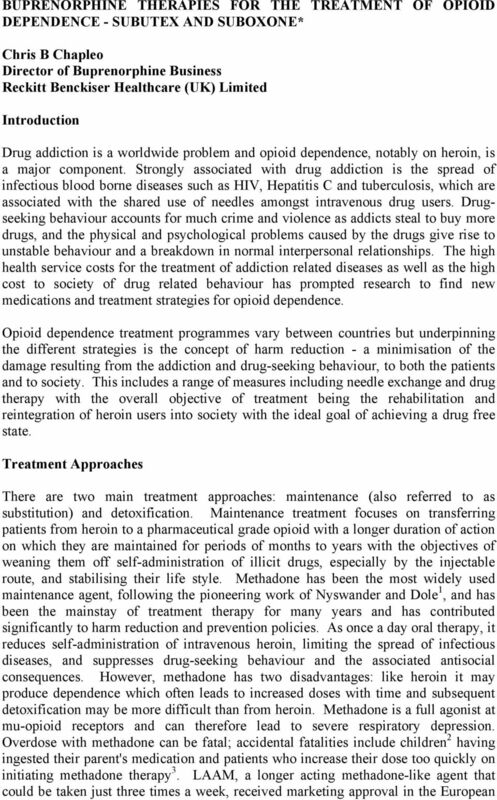 Considerations in Medication Assisted Treatment of Opiate Dependence. AOAAM OMED Education Program Sunday, October 7, Stephen A. Wyatt, D.O. Opioid dependence. Management in general practice. Street drugs. Overcoming barriers to GP treatment of opioid dependence. Background.